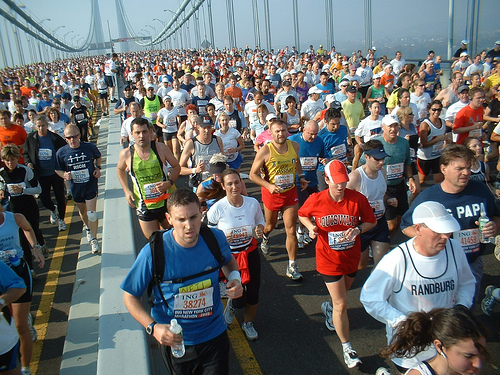 Many marathons are held each year in a wide range of locations. Some are held just simply based on tradition, while others are held for the purpose of raising money for a cause. For the better known marathons, hundreds and sometimes thousands of people participate. Unfortunately, more than half of them are in no way prepared physically for the demands that they are about to place on their bodies, and this can make running a marathon dangerous for those people. Because it is the most serious of potential problems associated with running a marathon, the biggest danger is cardiac problems – although this isn’t the most common thing that will happen. In this instance, the heart simply is not in the required shape for the demands that are placed on it when running a marathon. You won’t experience cardiac arrest during a marathon because you are too old to participate. Instead, it will be because you didn’t do enough training to get your heart in shape for this endeavor, or because you had existing cardiac problems to begin with. Aside from cardiac arrest, other injuries are possible, and more common. These injuries are to the muscle, bone, and joints, and typically occur simply because the runner wasn’t in shape for the marathon. Injuries to the knees, hips, ankles, and back are very common. In some cases, those injuries will heal with proper care and rest, but in other cases, those injuries will continue to haunt the runner for the rest of his or her life. In some instances, these injuries occur not because the person wasn’t in good enough shape, but because he or she becomes either dehydrated or over hydrated during the race, or immediately before the race. When you run for long distances, you can actually put extra strain on your kidney’s and your immune system. When these two systems go haywire, so to speak, other things start to happen within the body. The body thinks that it needs to be repaired, and starts this process by releasing stress hormones and cytokines. These hormones can actually cause inflammation, and they can affect your heart. So, as you can see, you must do more than get your heart in shape for the marathon, all of your other muscles, bones, joints, and bodily systems must also be properly prepared.